Companies need to realize their markets are often laughing - at them. The authors present a spirited, original, and wonderfully irreverent conversation that will challenge, provoke, and forever change your outlook on the digital economy. 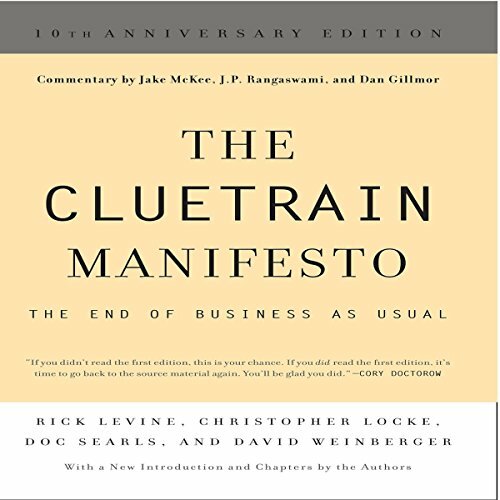 A rich tapestry of anecdotes, object lessons, parodies, insights, and predictions, The Cluetrain Manifesto illustrates how the internet has radically reframed the seemingly immutable laws of business - and what business needs to know to weather the seismic aftershocks. A best seller when it was published in 2000, The Cluetrain Manifesto remains more relevant than ever. Ten years after its original publication, the anniversary edition includes a new introduction and chapters by the authors, and commentary by Jake McKee, J. P. Rangaswami, and Dan Gillmor. Essential reading for anybody interested in the internet and e-commerce, this book is for anyone navigating the topography of the wired marketplace. OUTDATED! Only Relevant if You are New to the Web. If it was actually Relevant to 2015... this should have only been available until the end of 2013.. or it should have had a warning that this is actually only for people brand new to the internet. Sure.. but i'll be much more careful on reading the reviews, and the timeliness of the information they share. What does Brian A Morris bring to the story that you wouldn’t experience if you just read the book? Don't know.. i'd have have to read the book.. but that is NOT going to happen. Relevant if read in 2012... and even then, it was still for those new to the internet. Only by if you haven't logged on to the internet since 2010... or if you are a friend of the writers and don't have time to read the book and prefer to listen to the book on X3 times the speed.